Located seconds from the sand and surf, Bondi Backpackers boasts one of the best views of Sydney’s most iconic destinations – Bondi Beach. Making it perfect for travellers wishing to experience the amazing beach culture of Bondi and its surrounds. The recently refurbished property is home to a spacious rooftop furnished with umbrellas & deck chairs showcasing panoramic views of Bondi Beach, the coastline and its surrounds. 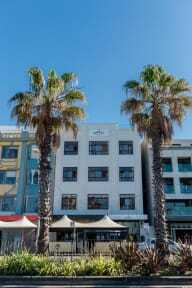 The multi-story hostel offers a range of room types from private twin and double rooms to 4 and 6 share mixed dorms with a number of premium dorm options looking straight over Bondi Beach. Bondi Backpackers plays host to a range of complimentary lifestyle activities such as rooftop yoga classes, personal training sessions and walking tours along the picturesque Bondi to Bronte coastline. For guests looking to try their hand at Australia’s most famous past time - free surfboard hire is also on offer. After a day of fitness and fun guests can unwind and mingle with a selection of weekly social events, from beach BBQs to wine & cheese nights and the not be missed; famous Aussie BBQ – every Friday night on the rooftop! For those wanting to venture further - the very best of Bondi’s vibrant nightlife lies right at their doorstep waiting to be explored. Please note this is an OVER 18 hostel ONLY! the location is AMAZING, literally in front of the beach, close to the bus stop and surrounded by many restaurants and bars. They organise many cool activities and events during the day and in the evening. If someone wants really to be picky, I would say that the lack of a big common dining room is an issue, especially for solo travelers who most probably want to meet other people. There is a room to eat but it is way to small and not so pleasant. Great time at this hostel! Super friendly staff ready to help you with anything. So many fun and free activities, you get to meet people, socialize. Special mention to Nick of the personal training in the morning. Absolutely sick workouts, great fun all the time!! I'd absolutely recommend it.